Tradelines for credit repair: Understanding both and how to use them. Definition of tradelines for credit repair. Just so we’re on the same page, let’s define the two terms under review. Repairing your credit is much more straight forward. Credit repair means the systematic legal challenges of outdated, inaccurate or misleading information in your credit report for the purpose of removing or correcting those issues. In short: “Tradelines” = add positive items to credit reports. “Credit repair” = remove negative items from your credit reports. Both typically improve credit scores. Although, tradelines are much faster at increasing credit scores. 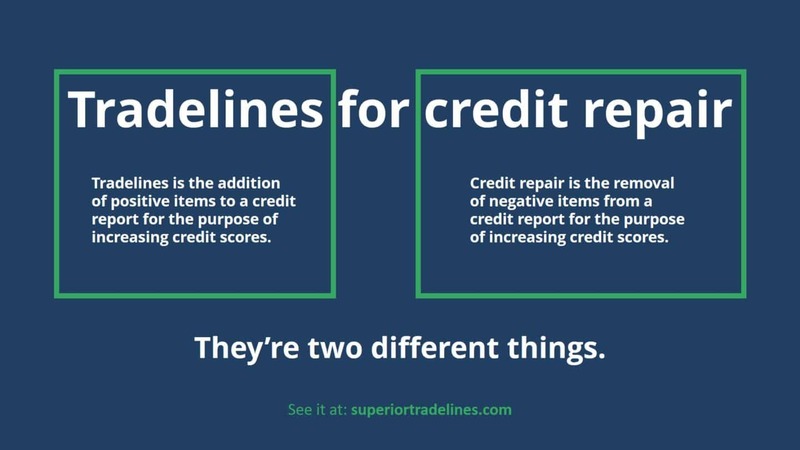 You don’t add tradelines before credit repair (assuming credit repair is needed). 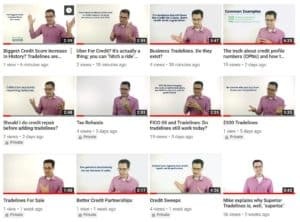 You rarely do them together (because you typically do credit repair before you add tradelines). Together, this means that you do not add tradelines in order to replace or skip over credit repair. One does not replace the other. They can both be done, but you need to do them in the right order. In addition, you need to make sure you’re working with a legitimate company for each. You should contact us for a free credit report analysis. If you want tradelines, that’s what we do and we do it well. However, we will not sell tradelines if you need credit repair first. We know that if you add tradelines when you actually needed credit repair, the tradelines aren’t going to work and you’re going to be an unhappy camper. This is why we perform a free credit report analysis. If you’re not ready, we recommend a credit repair service provider who we have worked with for nearly a decade and who has performed credit repair since 1993. Not a typo… 1993. Once you’re repaired, we are standing by to help you with tradelines. That’s when the significant score increases are realized. We look forward to working for you and watching you reach your credit potential. Previous Post You can’t use an ITIN to build credit and credit scores. Next Post Yes, you can go to jail if you use a CPN (or Credit Profile Number).